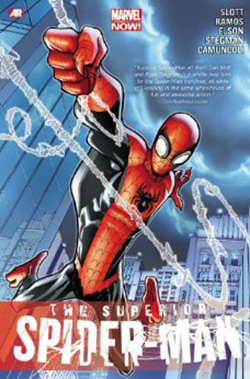 The Superior Spider-Man Vol 1. Spider-Man is dead. Or is he? After years of battling the wall-crawling menace, Doctor Otto Octavius (or Doctor Octopus if you prefer) was about to kick the bucket thanks to an incurable disease. In a last ditch effort to save himself as well as defeat Spider-Man, Doc Ock successfully managed to “switch brains” with his nemesis just in time for Spidey to die imprisoned in Doc Ock’s former body. There’s just one thing Doc Ock didn’t account for – while he has full control over Spidey’s body, he’s also infused with the memories of Peter Parker. Upon realizing exactly why Parker does what he does as Spider-Man, Doc Ock pledges to lead a good life and strive to continue Spider-Man’s legacy. Unfortunately for him, it’s not that easy to switch sides when you’ve been spending years as a self-absorbed evil genius. It’s not like Peter Parker is totally gone either. He’s still swinging alongside his former self as a ghost, acting like a sort of conscience to Doc Ock as he struggles to maintain his new role. While Doc Ock can’t see him or actually communicate with him, Parker acts as a comedic companion to inject some lightness into a few of the heavier scenes. There’s also this strange Spider-Man/Black Cat one-off in the middle of the book that really took me out of the story they were trying to tell. Not sure why the decision was made to inject it as a sort of bridge between the final issues of Amazing Spider-Man and the renewed Superior Spider-Man series. The whole idea is completely ridiculous and it should have fallen flat on its face but somehow, Dan Slott makes it work. It took a decent portion of the book for me to really get invested in the story but by the end I was ready for more. I’m hoping I can get my hands on the following two volumes and catch up to the point where I can start reading this monthly. December 12, 2013 in Comics, Dan Slott, Fiction.